Now it’s time to create a Facebook Fan Page. Make sure you’ve at least followed the basic profile setup for your Facebook Profile in Chapter 2 because you can’t create a Fan Page without a Facebook Profile setup. Facebook Fan Pages were introduced in late 2007 as a way to help businesses connect with customers on Facebook. Previously, Facebook had noticed that a lot of users (like me) had been marketing their business using their personal profile – and Facebook wanted to separate the business aspects of the site from the friendship and connection. So they created fan pages which are basically a profile page for a business (although there are several major differences as you will soon see). Step 1. Go to www.facebook.com/pages and click “Create your own” on the top right of the page. How to create a new Facebook fan page. Step 2. Pick your type of Fan Page that best relates to your business. If you’re a local business, pick “Local Business or Place.” Just try your best to pick the type of fan page that matches your business but don’t worry about it too much because Facebook allows you to change it after your page is set up. After you pick the business type, you will need to fill in some basic info about your business and pick your Business Name which will become the name of your fan page. There are two theories for how you should choose a Facebook fan page name. Use your company, blog or personal name. Plain and simple. This helps build your brand and looks the most professional. This way, when you post or when others share your content or mention your fan page, it shows up with your descriptive name – making it more likely for Facebook users to click it, come to your page and become your fan. It can also increase the number of fans who opt-in for your free report and join your email list. Descriptive naming is especially powerful if you enjoy commenting, sharing and interacting on Facebook – because every time you do so your Fan Page name is being seen by potential customers in their newsfeeds. Which naming strategy should you use? Basically, I recommend using the simple naming strategy for most businesses. If you’re a very social person and love to comment and interact on Facebook and are building your own personal brand then it may be better to use the descriptive naming strategy in order to display quickly who you are and how you help your customers. Step 3. Next, upload a photo for your fan page. I highly recommend uploading a photo of a person – either yourself or some of your employees. This is the photo people will be seeing in their news feeds and people on Facebook would much rather interact with a person than a brand – so make your fan page personable with a nice picture! Step 4. Fill out the About section of your fan page and your website. This section is indexed by Google so it’s important for Search Engine Optimization (SEO) as well as telling your fans and customers what you do. I recommend filling it out briefly to start with and then spend some time later on revamping it. Check out other popular fan pages to see how they are using the About section to promote their business. Tip: Because the About section is indexed by Google, make sure to include any keywords you would like to rank for. For example, if you sell doorknobs, make sure to include the keyword doorknobs in your About section. Now you’ve done all the basic work of setting up your fan page and you can go ahead and post your first status update! After you’ve posted your first status update, let’s complete all the details of maximizing your fan page for business. Again, just like with your personal profile, you’ll need to upload a Timeline cover photo. Remember, the dimensions of a cover photo should be 851 pixels wide x 315 or larger (because Facebook will automatically crop it). 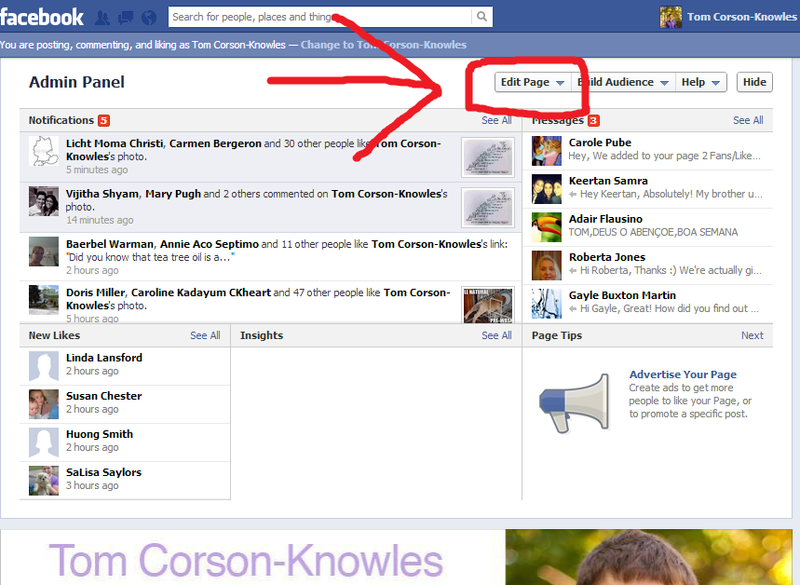 How to edit your Facebook fan page information. Depending on what type of fan page you have there will be different boxes in your info section. I recommend you fill out as much information as possible in each section to help your fans and customers learn more about you. Try to make your page info as descriptive and helpful as possible. Make sure to include a link to your business website! How to get more information on Facebook fan pages. Now that you’ve filled out all your Facebook info, click “Like” on your fan page to become the first fan! How to invite your friends to like your fan page. You can then select which of your friends to invite to like your fan page. I recommend inviting all of your friends! This will help you get as many fans as possible. Also, you need to get 25 fans to set up a Vanity URL which is basically a unique URL just for your page that makes it easier for customers to find you on Facebook. This is especially important if you will be promoting your Fan Page at a physical location (on your product packaging or in your stores). Although it’s much longer than I would like, I made it that way because www.facebook.com/tomcorsonknowles goes to my personal profile and was already taken. The best Vanity URL to choose is one that is simple, easy to spell and easy to remember, preferably the name of your business. For example, facebook.com/yourbusiness. That way, you can promote your Vanity URL for your fan page and make it easier for your customers to find you on Facebook.